I have been using NHM Writer 1.5.1.1 beta since 2008-09. This free software from New Horizon Mediain Chennai, India for Indian Language Software has been very useful for me and my friends to type in Tamil, Hindi, and other Indian languages using Microsoft Office Suite (2003, 2007, 2010) in Windows XP (Vista, Windows 7 32-bit and 64-bit) onwards. This software allows one to type Unicode Tamil, Hindi, and other Indian languages by simply running the program in the background and selecting a special key combination like “Alt+2” for “Tamil Phonetic” and “Alt+3” for “Malayalam Inscript”, etc.For Indians living abroad this is great tool to continue to maintain touch with our native languages, communicate with elders in their native tongue, and teach children born in non-Indian language speaking countries the Indian language. So along with eKallappai and Murasu Anjal NHM Writer 1.5.1.1 and NHM Converter have been great resource and help. Since sometime around early November or so the NHM Writer 1.5.1.1 has stopped working in several of my Windows computers. I could not select the languages by issuing the special key combo, for example, I set “Alt+2” for “Phonetic Tamil”. Typically the gray “Bell” symbol normally will turn yellow in color when I issue one of the key combos. Depending upon the underlying key combo I will be able to type Tamil, Malayalam, or Hindi. This was not happening.To make the matters worse, even I manually selected the language, the Unicode languages did not appear, and instead only English characters appeared. At first it puzzled me since several of my other computers still allowed me to use the software. When I tried to reinstall the program, I got a Trojan Horse virus warning from my McAfee VirusScan Suite and that prevented me installing the software altogether. The only way I could install the software was by disabling “Access Protection” and “On-Access Scan Disabling”. Even after installation with these “not recommended” anti-virus disables, I could not get the software to run since as soon as McAfee was enabled it went ahead and deleted NHMx.dll file. This made the software stop working. The error messages I got were “is-LJ372.tmp” is deleted with “Trojan Horse” detection as “Generic-FADE!7AA18D11D0E”. I could not figure out how to solve this problem. Uninstall and reinstall didn’t help (even after complete uninstall using RevoUninstaller and restart didn’t help). So I use eKallappai in these computers. As I mentioned above all the computers that I have running Norton Anti-Virus software (as of Dec 27, 2011) were NOT affected by this problem. So I have Windows XP, Windows Vista, Windows 7 (32- and 64-bit) that are running Microsoft Office 2003, 2007, and 2010 with Norton Anti-Virus is not affected. So I use in these computers NHM Writer 1.5.1.1 successfully. If you have suggestions to help solve the problem contact me at somaimb @ gmail (dot) com. Thanks. This seems to be McAfee ONLY problem as all my computers with Norton Anti-virus is fine. But I would still like to use program in McAfee installed machines. Our kitchen twin T12 fluorescent lamp suddenly went out even though we had just replaced it with Philips fluorescent lamps just last week. I heard a popping noise just before the lamps went almost light-less and gray. I assumed then the ballast must have gone bad since it is almost 6 years since I replace the ballast. I went to local hardware store to find replacement for my Philips Advance R2S40TP Magnetic Rapid Start ballast. But I couldn’t find the same model number (it looks like Philips is phasing out those ballasts with new electronic ballasts). So I bought the equivalent of it from Advance Philips ICN-2S40-N and the newer ballast is electronic as opposed the electromagnetic. I also bought a Ideal Industries digital multimeter (Model 61-310). Then I first disconnected the power at the mains, turned off the switch, put a flash light below, removed the lamps, removed the metal panel that hides the wires, and double checked the power-off using the multimeter and disconnected the wires. The reconnection proceeded with two red and blue wires each on the left hand side of the assembly, one each yellow wires on the right hand side of the assembly, then finally one each of white and black wires to the power line (it was color matched from ballast to the assembly). Then I replaced the cover, added the lamps, and tested to see (after power on ) everything worked okay. Time spent about 30 minutes from start to finish. I have used a Linksys modem for the last several years that is both DOCSIS 1.0 and 2.0 compliant. However, due to the pending improvements in my ISP provider’s speed upgrade and keeping up the improvements in technology, I decided to upgrade my modem. 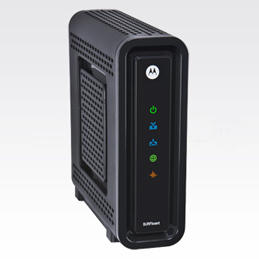 I looked around and checked with my ISP and found that the Motorola Surfboard Modem is supported by them and it is DOCSIS 3.0 compliant. I got that modem shipped and unwrapped and plugged it. There were three connections: Power, cable connection, and RJ45 connection. I plugged the power to the 110 VAC outlet, I plugged the BNC type connector (female) to the wire from the wall (male-type connector), and finally I plugged the RJ 45 connector to my wire-less router. I then spoke to my ISP and got my MAC address added to their database. With couple of power cycling of the modem and router (while still talking to the ISP service specialist) I was back on-line. It took about 15 minutes from the old to new modem. Soon the service speed will increase at least 30% according to my ISP. I wanted to replace the Epson Inkjet printer (Stylus C88+) and scanner (Epson Perfection 3170 Photo) since it has been a while since I bought both of them. So I was deciding which printer to buy. However, for home use color and b&w printing the choices for printer-only were very limited. I didn’t want to buy a laser color printer due toits price. So I decided to consult Consumer Reports magazine (which I usually do when I buy most of the items, anyway). They have suggested that all-in-printer is a better option since it gives more choices in price, capabilities, and manufacturers. After checking out several models and options, I decided to go with Canon Pixma MX 420 Laserjet All-in-One color printer with wireless capabilities. I set-up the printer this evening and installed the drivers on my home PC with wireless connections. I did this on another laptop as well. I did one test printing and remote (wi-fi) scanning of a document. The results were reasonable. I will explore more functions soon. Hope this will be a good addition to my home office.